This calculator comes to the Old Calculator Web Museum through the courtesy of my parents, to whom I'm very grateful for their generosity and support, not just for my hobby, but throughout my entire life. This machine came up for auction on eBay in 2011. I knew that it would garner a lot of interest in the calculator collector community, as the Wang 100-Series calculators are extremely rare finds. I generally try to avoid eBay as a means for acquiring machines for the museum, as the prices there tend to run high, especially on older, less common calculators. If I wanted this machine, I was going to have to bid aggressively. Unfortunately, I had recently been laid off my job due to a corporate merger which made my job "redundant", and was thus unemployed. Clearly, with money rather tight, and having just moved into our new home (and assuming the new mortgage payments), the chances of being able to bid competitively on this machine were slim to none. To the rescue came my Mom and Dad, whom I told of my frustration. Their response, "Bid to win, and we'll pay for it!". I was both stunned and elated at the same time. But, would I be able to get the high-bid in during the last few moments of bidding due to the typical "sniping" frenzy that occurs on eBay just before an interesting auction closes? As the auction neared its end, I kept my high bid position, on the basis of a high bid I placed early on in the auction. As the seconds ticked away, I thought there wasn't going to be any competing bids. Then, in the last 15 seconds, the bidding went nuts. My high bid quickly fell, and I had a number of browser windows open with varying bids. I clicked over to the window with the highest amount I'd pre-prepared, and pushed the submit button with about 5 seconds left in the auction. I didn't get an immediate response...there were apparently a lot of bidders hammering away at it, likely including some "bid-bots". Finally, I got a response, indicating that I had somehow managed to get my winning bid in exactly as the auction closed. I had won, thus assuring the machine a permanent home in the Old Calculator Museum. I was ecstatic, as I'd been searching for one of these machines for the museum for a long time. I immediately made payment for the machine, and then the waiting began. It seemed like an eternity waiting for the machine to arrive. The auction stated that the machine was not operating properly. It would come up with a display, but wasn't responsive to input. While waiting for the machine to arrive, I poured over the schematics for the machine, trying to learn as much as I could about the architecture of the machine. The schematics had been acquired some time ago, thanks to a fellow Wang Labs enthusiast. While schematics are great for troubleshooting, they're a bit tedious as tools to determine the general operational principles of a calculator. But, through a lot of study, I could at least determine some architectural basics before the machine arrived, which would come in very handy as the troubleshooting began. The 100-series machines are built with a majority of small-scale TTL and some DTL integrated circuits, much like the earlier Wang 700-series machines, though slightly higher-levels of integration are taken advantage of to reduce component count. The complex ferro-magnetic ROM of the 700-series is replaced by an almost ridiculously large diode ROM, likely implemented this way as a cost-saving measure, though I can't imagine that the savings were that great due to the massive volume (literally hundreds) of diodes involved. The expensive magnetic core memory of the 700-series is replaced with very early MOS Large Scale IC-based static RAM, organized as 128x4 or 256x4, depending on the model of machine. The digit parallel architecture of the 700-series is replaced by a bit-serial architecture (another cost-saving measure, as bit-serial architectures, while generally slower, use far fewer components). It became very clear in the study of the machine that it was a purposeful attempt to reduce the cost of a capable calculator, surely as a response to market pressure from Wang's competitors. The design of the 100-series machines likely began sometime in early to mid-1969, as the finishing touches were being placed on the 700-series prior to its release in January, 1970. The Wang Labs 100-Series calculators were indeed a measure taken by the company to bring down the cost of a multi-purpose, higher-end electronic calculator. While Wang was having great success in the market with it's long-in-coming 700-Series machines, competitors were creating strong threats to Wang's market share. 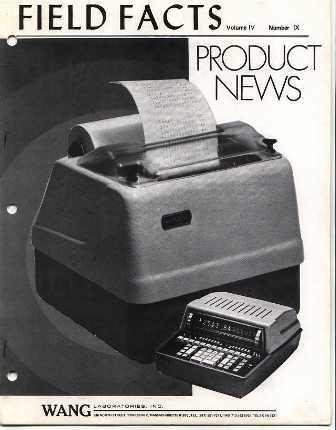 Hewlett- Packard's 9100A/B calculators had tipped the balance away from Wang in the high-end calculator marketplace. Entries from Olivetti ( Programma 101); Computer Design Corporation (a.k.a. Compucorp), along with Monroe's OEM versions of Compucorp's advanced technology calculators; Cintra's 909 and 911; and Mathatronics' Mathatron calculators, among others, all encroached on Wang's market territory, making a tangible dent in Wang's profit-making opportunities. The 100-Series machines, introduced in June of 1970, were designed to compete in the $1,000 to $2,200 price range, significantly less-expensive than the Wang 700 machines, but were also significantly less-powerful. 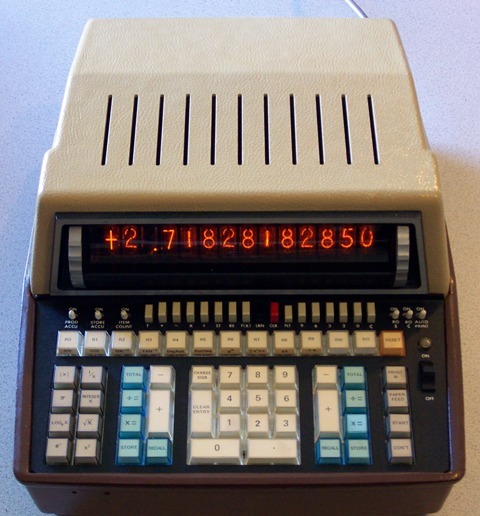 The 100-series calculators were first publically shown at the WESCON trade show in Los Angeles, CA, August 25-28, 1970. The 100-Series were developed in a modular fashion to allow various models of the machine to address three specific market disciplines: Business, Scientific, and Statistical. All told, there were twelve different models in the series, with four models of each discipline. The variances between the models of each discipline were memory capacity (6 or 14 registers), and output method (Nixie display or built-in dot-matrix printer). The Business machines were the Model 102 (Six memories w/Nixie display); Model 112 (Six memories w/Printer); Model 104 (14 memories w/Nixie display); and the Model 114 (14 memories w/Printer). The Statistical machines comprised the Model 122 (Six memories w/Nixie display); Model 132 (Six memories w/Printer); Model 124 (14 memories w/Nixie display); Model 134 (14 memories, w/Printer). Lastly, the Scientific machines consist of the Model 142 (Six memories, w/Nixie display); Model 152 (Six memories w/Printer); Model 144 (14 memories w/Nixie display) [Exhibited here], and the Model 154 (14 memories w/Printer). The machines all share a capacity of twelve significant digits with sign in all registers. Options included MOS ROM "subroutine" (Wang's nomenclature) boards that contain pre-coded programs for trigonometry or advanced statistical functions. 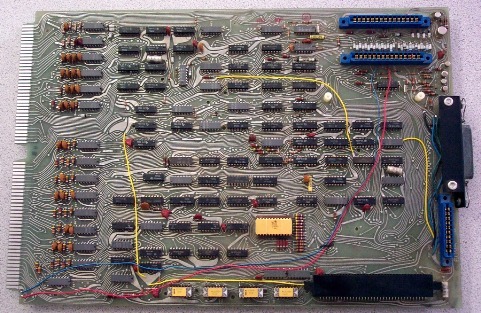 These ROM boards could be field-installed to immediately upgrade any member of the 100-Series with more advanced math functions. The subroutine board plugs into an edge connector socket on the display or printer interface board. Along with ROM function upgrades, the positions on the circuit board for RAM chips is socketed, making it possible for the memory chips to be easily upgraded in the field. Base memory consists of 2 256-bit RAM chips (Intel 1101's or second-sourced parts), and can be upgraded to 4 256-bit RAM chips. Machines with the two RAM chips offer the "left" and "right" arithmetic units, and memory registers R0 through R3 for a total of 6 registers. The machines equipped with four RAM chips offer 12 memory registers (R0 through R11), and the two base arithmetic units ("left" & "right") for a total of 14 registers. 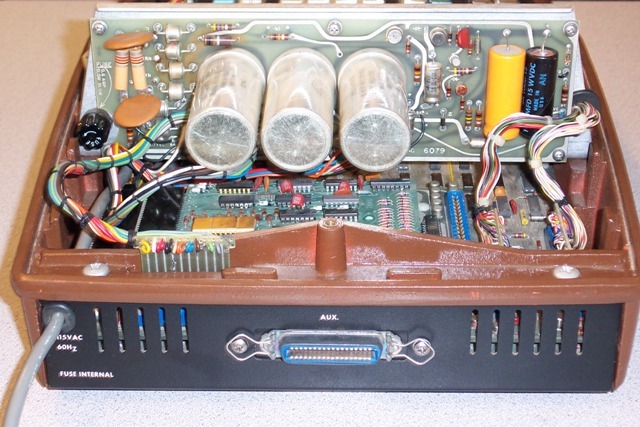 Rear View of Wang 144T showing power supply detail. Note "AUX" connector on back panel for peripheral connection. While the 100-series machines are not learn-mode (internally stored) programmable (more on this later in the exhibit) like the big-brother 700-series machines, they can be programmed by the connection of external punched card readers, making them programmable in a way similar to that of the original transistorized Wang LOCI and Wang 300-series calculators. The model 184 Master Card Reader, and the Model 185 Slave Card Reader, each capable of reading a punched card containing 60 program steps, can be connected in daisy-chain fashion to the calculator via a connector on the back panel of the machine to provide for a maximum of 120 steps of programming capacity with both a 184 and 185 card reader connected. 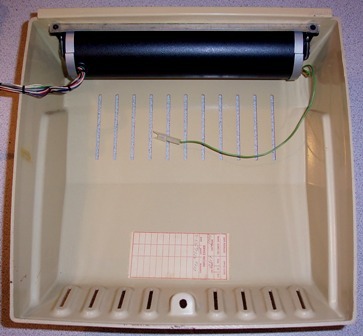 Punched card programs are prepared with a Port-O-Punch device (see the Wang 360SE exhibit for information about the Port-O-Punch). For the Nixie tube display models, an external printer, the Model 180, can be connected to get permanent printout of calculator operations. It isn't clear if it was possible to connect both the external printer and card readers to a 100-series machine at the same time. After about a week of waiting, the machine arrived. Fortunately, it was very well-packaged, and survived the rigors of shipping with no apparent problems. First order of business is a thorough inspection, both to assure that no hidden shipping damage occurred, and also to make sure that nothing has loosened or shifted in shipping, along with looking for any signs of failed components. The machine was in remarkably nice condition, very clean, showing very little wear and tear outside, and just a little dusty inside. The first impression of the machine was that its mechanical design was a distinct improvement over Wang's earlier calculators. The whole machine can be stripped down by removing a total of nine fasteners. The machine is very modular, with the power supply module secured with four screws, the display unit and top housing secured with one screw, the main electronics assembly secured by two bolts with nuts, and the keyboard assembly is secured by two plastic "pushbutton" fasteners. The base of the machine is a heavy plastic or plastic composite one-piece casting. It appears that this base could come in one of two colors, either a medium-brown or a muted-orange color. There is no indication that the buyer had a choice of color as there's nothing in any of the documentation that I've been able to find that suggests a choice of colors was available when ordering the 100-series calculator. The main logic assembly slides into the the base on card edge guides moulded into the base. The top cabinet, containing the Nixie display assembly, is a heavy-gauge plastic casting, though a different type of material than the base. The material resembles the same material as the upper cabinetry of the Wang 500/ 600/700- series calculators. All of the various electronic assemblies plug together with various types of connectors that are easily disconnected to isolate the various subassemblies. 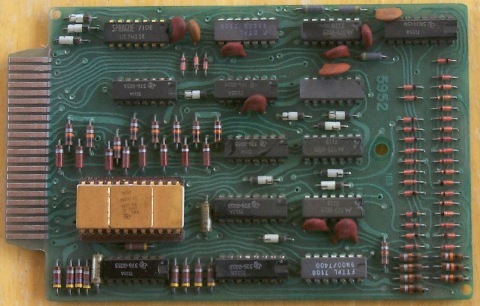 The backplane consists of two blocks of three 72-pin edge connectors with a circuit board connecting the three connectors together. The stack of three boards (main logic board, and two boards that make up the diode microcode ROM) plug into these connector blocks. Given that the machine doesn't the contain power-hungry magnetic ROM and core memory, heat dissipation is such that the machine doesn't require a fan, and can keep cool enough simply through convection cooling via slots and grilles in the cabinetry to allow airflow. This makes for much quieter office operation with the exception of the clickey-clack of the impact printer-equipped machines. A careful visual inspection of the machine showed nothing of concern. There were no signs of any smoked components or other obvious problems. One thing that became clear that the "T" after the model number on this machine indicates that the machine is equipped with an optional trigonometric subroutine board which adds some trig. functions along with other capabilities. With the visual inspection completed, the machine was broken down into its various modules and spread out on the workbench so it could be powered up in such a way that all of the components would be visible, and available for probing voltages and signals while powered up. Before powering up, all of the edge connector contacts were cleaned, as long periods of storage can result in corrosion from atmospheric contaminants and ambient moisture. I was hopeful that this was all that was wrong with the machine, as there was a thin film of oxidation on the edge connector fingers, and that this cleaning would solve the problem with the machine. First the power supply was isloated from the rest of the electronics, and a quick check of the output voltages was done, with the power supply on a variac, slowly ramping up the input voltage until it was at full line voltage potential. Everything looked good -- voltages were within reasonable tolerances, and there was very little sign of ripple on all of the DC voltages. A dummy load was placed on the +5V supply line, which provides power to most all of the logic, and even under load, the voltage and ripple stayed within acceptable limits. Assured that the power supply was OK, I reconnected it to the logic, and powered up with with the variac, again slowly ramping the input voltage up to full line voltage. As the variac voltage approached about 90V AC, the Nixies started to light up...an encouraging sign. Once the variac was at 100%, the symptoms were pretty clear. The display would fill with either zeroes or twos, sometimes flickering between all zeroes and all twos. Input on the keyboard (including the [RESET] and [CLEAR ALL] keys) caused nothing except sometimes a slight flickering of the display. It was clear that the eBay auction description was accurate. Power supply output voltages were all checked again under actual load, and all were good both in terms of regulation and ripple. At this point, I knew that the problem was outside the power supply, and wasn't due to any problems with oxidation on connector fingers. The power supply is very conventional, with a step-down transformer to take the mains power down to lower AC voltage levels, which are rectified by diode bridges, smoothed by large computer-grade capacitors, then regulated by zener diode/pass transistor regulators. 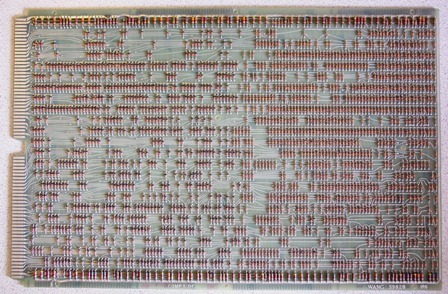 The working memory of this calculator is made up of four 1101A 256x1 bit MOS Random Access Memory (RAM) chips. These devices were introduced by Intel in the summer of 1969, and were the first MOS (Metal Oxide Semiconductor) static Random Acces Memory chips on the market. 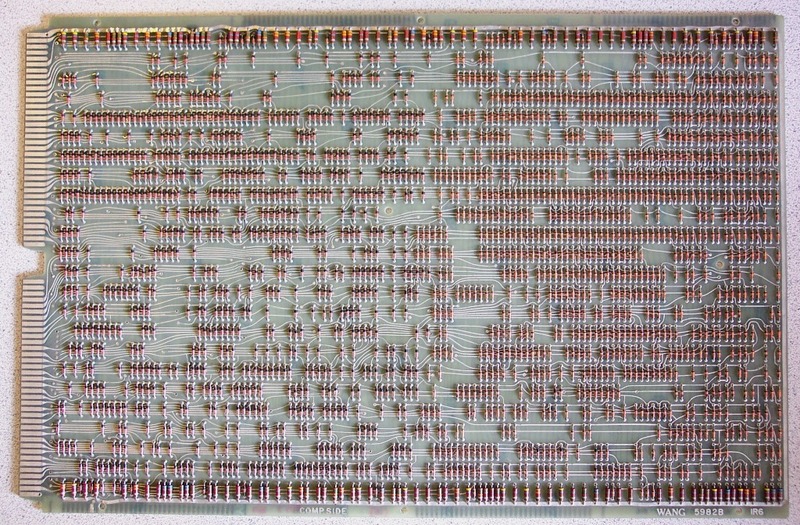 The 1101 RAM chip is considered one of the breakthrough technologies that spelled the beginning of the end of magnetic core memory for computer/calculator memory. 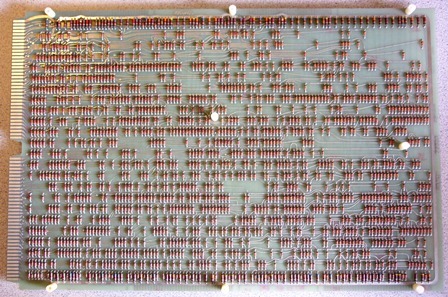 The 1101's proved to be popular among computer manufacturers, and were later second sourced by a number of IC manufacturers, including AMD, Mostek, Intersil, National, and MIL (Microsystems International Ltd.). The chips used in the exhibited machine consist of two Intel-made 1101's, and two 1101's made by Microsystems International. The date codes on the parts are very close, so it's likely that these are the original chips in the machine, and it just happened that two different vendor's chips were used. The memory is accessed one chip at a time, reading out the single-bit content of each memory address as a four bit serial stream. These PMOS (Positive MOS) memory chips require +5V and -9V logic supplies to operate properly. Probing the power supply pins of the memory devices showed that the pins that should be at -9V were running at -12V. OOPS! Referring to the schematic, I found that there is a zener diode/pass-transistor voltage regulator located on the main logic board whose purpose is to regulate the -12V supply from the power supply down to approx. -9.2V for operating the RAM chips. Checking through this circuitry showed that the pass transistor, a PNP device, was shorted, allowing the -12V to flow straight through without regulation. 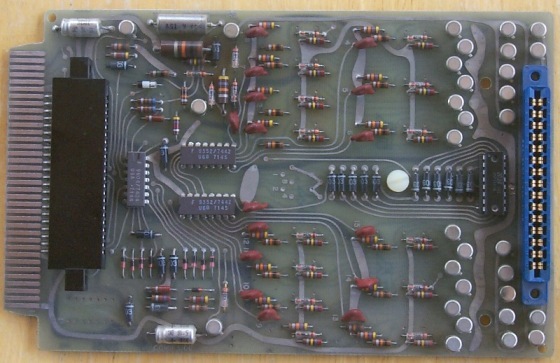 Unfortunately, the schematics mention only a Wang internal part number for this transistor, and there are no signs of any usable part number or manufacturer on the transistor itself. I didn't have any way to identify the part's manufacturer or manufacturer part number. Since the transistor was shorted, there was no way to measure the parameters of the transistor to determine an appropriate replacement. It also wasn't clear if the transistor was silicon or germanium. Rather than go through a tedious trial and error process to find an appropriate replacement transistor, the voltage regulator circuit was bypassed, and replaced with a single 7909 -9V Voltage Regulator IC. This device has three pins, Vin, Vout, and Ground. 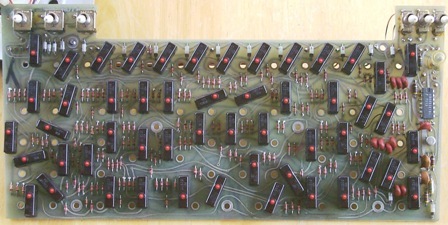 The -12V main supply was routed to the Vin pin, the Vout pin was connected to the circuit board trace providing the -9V supply to the memory chips, and the Ground pin was connected to a nearby circuit board trace that provides logic ground to the IC's. The regulator was tested without the RAM chips in place, and delivered a very clean -9V. The RAM chips from the 144T were then placed in a Wang C-52 calculator (a later design machine that uses the same chips), and I was overjoyed to find that the chips were good -- the application of -12V to the chips due to the failed regulator did not damage them, which was quite a worry because these chips are very difficult to find today. The RAM IC's were returned to the 100-series logic board (the chips are socketed), and the machine was powered up with the new voltage regulation in place. The -9V power supply was checked again, and stood steady at the correct voltage. Sadly, though, once powered up, the machine was still not completely healthy. The machine would now respond to keypresses accurately at times, but most of the time, the "all twos" problem would appear. There was no rhyme nor reason to the behavior -- it was very intermittent and unpredictable. After some experimentation, it was apparent that the somewhere, the 21 bit was stuck "on", as entering a 1 (0001) would cause 3 (0011) to be entered, and entering a 5 (0101) would cause 7 (0111) to be displayed. Entering a 9 (1001) would result in a strange combination of digits within a single Nixie tube to be lit at once, apparently because the resulting code (1011) is an invalid input to the BCD (Binary-Coded Decimal) to Decimal decoder IC. With the RAM now apparently working, the machine was also responsive to math operation keys, but with the 21 bit stuck, the machine seemed to get rather confused, delivering answers that were nonsense. During the random short periods of time where the bit "unstuck", the machine seemed to function properly, and I was able to perform all four math functions in both arithmetic units and get correct answers, but it took a long time to perform this testing because the machine would keep going back into its "sick" state. It was both encouraging and frustrating at the same time, having a machine that worked a small portion of the time, but the rest of the time was faulty. The next step was to try to track down why this was happening. The first thought was perhaps something was wrong with the keyboard, with an intermittent connection causing the 21 bit to be stuck high. The keyboard encodes keypresses via a diode matrix that results in each key generating a unique eight bit code. Observing the output of the keyboard assembly by probing its outputs while pressing various keys showed that the correct codes were being generated, and the finicky 21 bit was rock solid coming out of the keyboard. I then checked the keyboard code latches, which are eight simple R/S (Reset/Set) flip-flops made of two NAND gates each. These, too, seemed OK.
Next, I checked to see if perhaps something was wrong with the display decoding. If there was an intermittent problem with the display decoding, it could result in the symptom being observed. The display driver circuitry is on a separate circuit board that plugs into the main logic board. The reason for this is that on the 100-Series machines, the output to the user can either be by Nixie tube display, or by a built-in printer. In the printer- equipped models, this display driver board is replaced by a printer driver board that contains most of the logic to run the printer. The Nixie display driver board uses a TTL 74141 BCD to Decimal decoder chip, mounted in a socket, to convert the 4-bit BCD output of the "C" register (a temporary register) into a one-of-ten selection that drives the particular digit in a Nixie tube. The chip was removed from the socket, and the pins inspected to see if there was any oxidation. Sometimes old IC's develop a layer of oxidation on their pins that can cause intermittent connections. In this case, the chip was clean. The socket also looked to be in good shape, and the chip fit tightly in the socket. The chip was returned to its socket, and the machine powered up again, with an oscilloscope observing the 20 and 21 inputs to the 74141. The display system on the 100-series machines is multiplexed, and thus, monitoring the inputs to the decoder chip should show a pulse train representing the state of each of the digits in the display, one after the other. The trace representing the 20 bit always reflected the proper bit pattern based on what was being displayed. However, the 21 bit would sometimes show the proper bit pattern, but the majority of the time, it would go to logic "1", and stick there. When this happened, the display would fill with twos when CLEAR ALL pushbutton was depressed. The question then became whether the problem had something to do with the decoder chip's input dragging the line high, or if the source of the signal was the problem. The 21 input pin for the 74141 decoder chip was pulled outside the socket, and the signal monitored again. The symptoms persisted, so the problem had to be upstream of the decoder chip. The display bit accumulator shift register schematic. Highlighted area is the section of suspect logic. Working backward from the display subsystem, the schematics showed that the display board is fed by a serial to parallel converter on the main logic board that takes bits one at a time as they come out of the arithmetic logic unit and shifts them through a five-bit shift register. Once four bits are accumulated in the top four bits of the shift register, the display is strobed, and the digit represented by the four bit BCD code is decoded by the display driver board and displayed on one nixie tube. This process is repeated for each digit on the display, at such a rate that the display appears continuous to the human eye. I surmised that either one of the flip flops that make up the shift register, or, the gating that strobes the output of the flip flops were the source of the problem. Observing the output of the shift register flip flop in the 21 position with the oscilloscope showed that the output would occasionally be as expected, but most of the time, it was stuck at logic "1". Observing the inputs to the flip flop showed that they were moving as expected, so the problem had to be that particular flip flop. The chain of flip flops making up this register, called the "C" register, is made up of TTL 7476 Dual J/K Flip Flops with Preset and Clear inputs. Since each 7476 IC contains two flip flops, I checked and found that the other flip flop in the package was working fine. So, the problem only manifested itself in one of the two flip flops in the IC package. 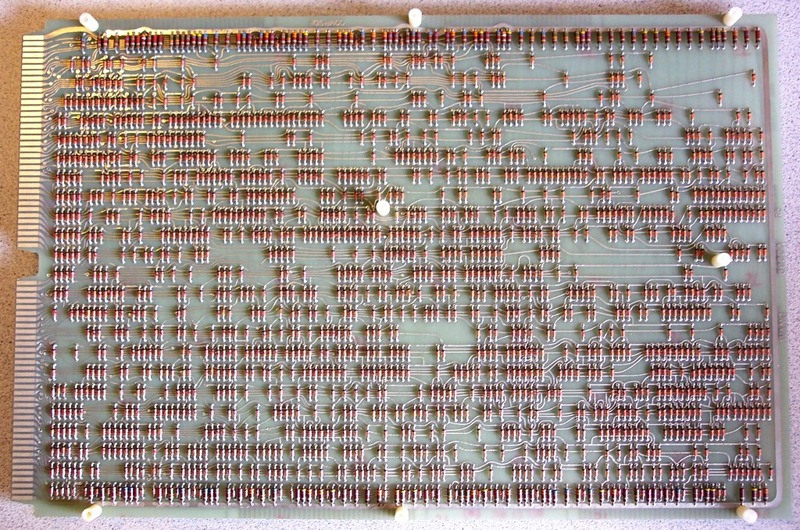 The 7476 IC in question was carefully desoldered and removed from the logic board, and replaced with a 1976-vintage chip from the museum's stock of spare parts. When powered up, the machine was restored to proper operation! Needless to say, I was very happy that the repairs required were relatively simple, both to isolate, and repair. Once the machine was fully operational, I could explore its various features and quirks. While I could tell right away that the machine was quite a departure from the 700-Series calculators by looking at the keyboard, once I had the machine running properly, it became very clear that the 100-Series calculators were operationally patterned after the 300-Series calculators, yet architecturally, adopted the basics of the microcoded design of the 700-Series. The machine features two main arithmetic units, each capable of the basic four math functions. These are known as the "left" and "right" arithmetic units. The name of the arithmetic unit is determined by the contol keys for the arithmetic unit's position on the keyboard in relation to the numeric keypad. Each arithmetic unit provides a working register which contains the result of the last calculation performed by the arithmetic unit. Each arithmetic unit is independent, and has a block of seven keyboard keys to control it. 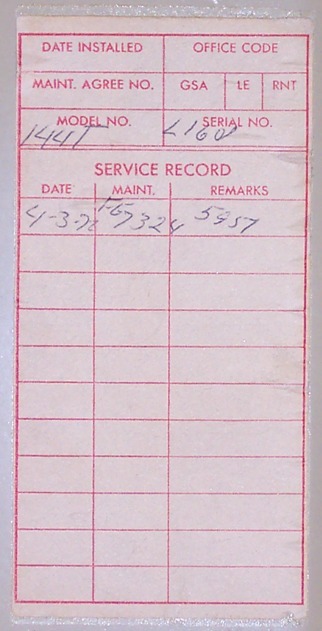 The [STORE] key places the content of the numeric entry register (as shown on the display) into the arithmetic unit's register. The [RECALL] key recalls the content of the arithmetic unit into the display's working register. The [TOTAL] key performs the same function as the [RECALL] key, but clears the arithmetic unit afterwards. The [+] key adds the number in the display to the number in the arithmetic unit, and displays the result. The [-] key subtracts the number in the display from the quantity in the arithmetic unit, and displays the result. The [X=] key multiplies the content of the display by the number in the arithmetic unit, and displays the product. Lastly, the [÷=] key divides the number in the arithmetic unit by the number in the display, and presents the quotient in the display. The left-most section of the keyboard controls the built-in higher-level math functions. Eight keys provide absolute value, reciprocal, recall of the constant Pi, integerize, basee logarithm, square root, ex, and square. These functions operate on the number in the display, place the result in the display, and do not affect the state of the "left" and "right" arithmetic units. At the right end of the keyboard are four keys for peripheral control. The [PRINT W] key causes the content of the display to be printed, either on the internal printer (on models so-equipped), or to an externally connected printer. Without a printer, the key performs no function. Also for controlling a printer, the [PAPER FEED] key allows the paper on the to be advanced one line for each press. Again, if no printer is attached, this key performs no function. 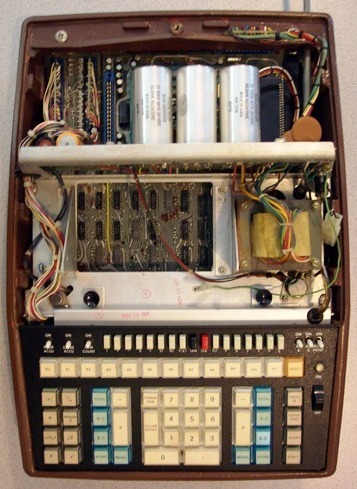 The [START] and [CONT] keys are used when the Model 184/185 Punched Card Readers are connected to the AUX connector on the back panel of the calculator. The [START] key begins execution of the program coded on a card in the 184 Master Card Reader. The [CONT] key is pressed to resume execution after programmed stops to wait for data input or to display results are encountered in the program. To the right of these keys lies the power switch (slide up to turn on the machine). Above the power switch is an incandescent lamp that lights up to indicate that the machine is busy calculating. Above the area of keys outlined above is a row of 13 keys. The right-most key of this bunch, colored pink, is labeled [RESET]. This key resets the logic of the machine. This is kind of misleading, as pressing the [RESET] key does not clear any of the registers. It simply places the logic of the machine into a defined state. It also resets the overflow condition. It should be noted here that the calculator does not have any power-on clear feature. When the machine is powered up, the display is generally blank, and the "BUSY" lamp is on. To clear this condition, the [RESET] key is pressed, at which time the display fills with random digits. At this point, the left and right accululator and memory registers are also filled with random numbers. It is then necessary to depress the [CLEAR ALL] button and release it to zero out all of the registers. At this point, the machine is cleared and ready to use. The remaining twelve keys address the memory registers of the machine. The memory register keys are labeled [R0] through [R11], representing the (4 or 12) memory storage registers of the machine. In the case of the machine exhibited, there are 12 memory registers available (R0 through R11). On machines with less RAM, the [R0] through [R3] keys control the four memory registers available, and the remaining keys (R4 throgh R11) perform no memory operation. The off-white function select pushbuttons above the memory addressing keys are labeled [T], [+], [-], [X], [÷], [ST], [RC], and [F(x)]. These function select buttons are mutually exclusive, so pressing one key will cause it to lock down, and will cancel any existing depressed button, causing it to pop up. These pushbuttons control the action that occurs when one of the memory selection keys are pressed. In essence, each memory register is its own arithmetic unit, capable of the same functions as either the "left" or "right" arithmetic units. Each memory register can have the basic four math functions (+,-,X,÷) performed on it, as well as storing a number into the memory register [ST], recalling the content of a memory register to the display [RC], and recalling and clearing the register [T]. For example, to add the content of the display (assuming the display contains 14, and memory register R6 contains 20), the user would depress the [+] memory function select button down, then would press memory key [R6] to address memory register 6. The content of the display (14) would be added to the existing content of memory register 6 (20), and the result (34) is placed into memory register 6, and copied to the display. In essence, this functionality provides the machine with a total of 6 or 14 (including the "left" and "right" arithmetic units) four function arithmetic units that can be used independently. It is an unusual arrangement as far as calculators go, but can be quite powerful, especially when utilized within a complex math process. The [F(x)] function pushbutton is special, as it changes the operation of the memory addressing keys. When the calculator is equipped with a "subroutine" option board (such as the exhibited model having the T [for Trigonometric] option), the operation of the memory addressing keys changes such that the keys now select which subroutine function to execute. When the [F(x)] button is depressed, the memory address keys instead invoke a specific subroutine operation coded in the option ROM. For example, with the trig. option, the [R0] key calculates the trigonometric sine of the angle (in degrees) shown on the display, and puts the result in the display. It appears that the code stored in the option ROM is keycode programming written to carry out the various higher level math functions as if entered (at high speed) from the keyboard. These option subroutine functions utilize R0, R1, and R2 memory registers when performing their operations, so one must be careful to make sure that when performing operations with lots of variables that these registers do not contain important values, as they will be overwritten by the invocation of some of the subroutine functions. A number of other keys make up the main part of the keyboard. The numeric keypad is of standard layout, with double-sized zero and decimal point keys. Digit entry on the machine proceeds left to right on the display, and entering a decimal point consumes an entire digit position. Entering more than 12 significant digits will result in an overflow error condition, which is indicated by a flashing display. The [RESET] key will clear the overflow condition, but leave the number as entered thus far in the display. The [CHANGE SIGN] key toggles the sign of the number in the display. The [CLEAR DISPLAY] key does exactly what it says, clearing the display, so only a "+" sign appears at the left end of the display, readying the machine for numeric entry. This key is typically used for clearing numeric entry errors. Along with the memory function selection pushbuttons, another group of pushbuttons selects the decimal point operation mode. 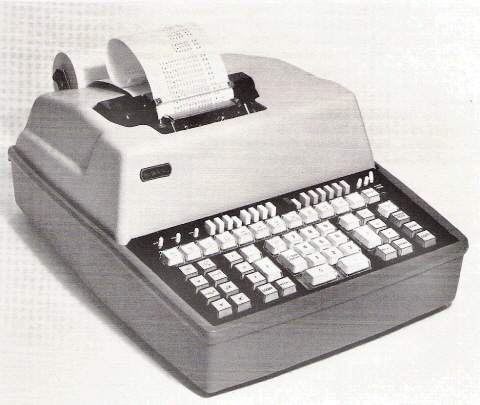 The 100-Series calculators can operate with either fixed (at 0, 2, 3, 5, or 9 digits behind the decimal), full floating decimal (FLT), or a special "dollars and cents" (¢) mode, which fixes the decimal at two digits behind the decimal point, and assumes that numeric entries are made as dollars and cents, with the last two entered digits falling behind the decimal point. For example with the machine set in this mode, entering    " will result in "+ 12.34" showing in the display. This makes dealing with financial calculations a bit easier, causing the machine to act more like an adding machine than a calculator. A single red pushbutton labelled [CLEAR ALL] is a momentary contact switch. When depressed, the display changes to a curious state, where all digits within each Nixie tube are all lit at once. As long as the switch is held down, this condition persists. When the switch is released, the display shows all zeroes, and all of the registers of the machine are cleared, including the left and right arithmetic registers, and the memory registers. The black pushbutton to the left of the [CLEAR ALL] button is a sign that the Wang 100-Series calculators did not have a very long market lifetime. It is a push-on/push-off switch labeled [LRN]. One would assume that this is to enable "learn mode" programming, as an identically labeled switch on the Wang 700-Series calculators provide. However, such an assumption is incorrect, as it turned out, the learn-mode programmability of the 100-Series calculators was a feature that never made it to market. The intention in the design phase of the machines was to provide an optional add-on that would allow the 100-Series machines to be learn-mode programmed, but due to the breakneck rate of technology change, along with market pressures, the 100-Series simply didn't have a long-enough market lifetime to justify the development of such a feature. 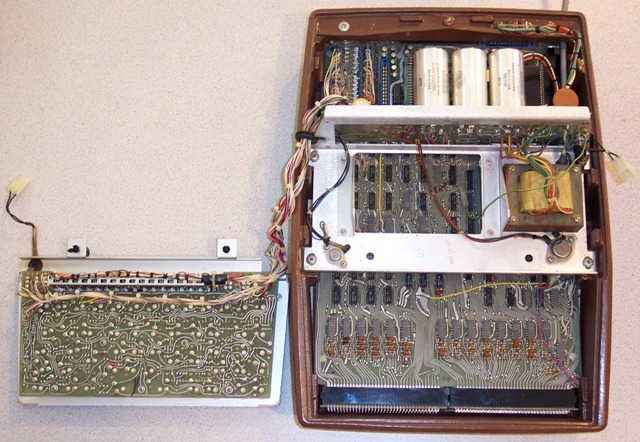 As a result, the programmability of the 100-Series was limited to punched card programmbility similar to the 300-series calculators. The [START] and [CONT] keys, which seem like they'd be provided for controlling the execution of stored programs, are actually wired up to deal with controlling external punched card readers only, and have no bearing on the operation of the main logic of the calculator. All that the [LRN] switch does is generate two signals, one positive logic, the other negative logic, representing the state of the LRN switch, which are both fed directly into the diode microcode ROM. The microcode may actually have code in it for communicating with some kind of add-on programmer option, but because no such unit exists, operating the calculator with the LRN button depressed, results in the calculator becoming rather confused. Pressing keyboard keys results in random things happening on the display. Sometimes individual digits will go blank, other times random numbers will appear in some digit positions. A number of toggle switches on the keyboard panel control various accumulation modes and other miscellanous functions. The first (from the left) of the toggle switches is a carry-over function from the 300-series calculators. "PROD ACCUM", when switched on, causes a sum-of-products accumulation to occur. As products (or quotients) are generated in the right arithmetic unit, a running sum of the results is automatically accumulated in memory register R0. This operation is useful for various statistical operations. The "STORE ACCUM" switch enables memory register R1 to accumulate entries stored in the right arithmetic unit via the [STORE] key. If the sequence " [RIGHT-STORE]  [RIGHT-STORE]  [RIGHT-STORE]" were performed, recalling memory register R1 would result in 6 being displayed, the sum of 1, 2, and 3. The "ITEM COUNT" switch counts the number of times the [+] or [-] key is pressed on right arithmetic unit. The count is stored in memory register R2. This function is useful for performing operations such as averaging a list of numbers. It is worthwhile to note that if the accumulation functions are enabled when using the trigonometric functions provided by the "T" option, erroneous results can occur, as the trigonometric functions also use some of the memory registers, and the accumulation functions conflict with the trig functions. It's therefore a good idea to make sure all of the accumulation mode switches are turned off before using the functions contained in an optional subroutine module. The "RO $" and "RO ¢" switches control rounding mode when the machine is in financial mode (¢ decimal-point mode selected). These switches enable the rounding off (5 up/4 down) of dollars and/or cents in the result of calculation. The [AUTO PRINT] key causes the result of a calculation to automatically be printed on the built-in (on so-equipped 100-series calculators) or external printer if attached. If no printing device is available, the setting of this switch is irrelevant. 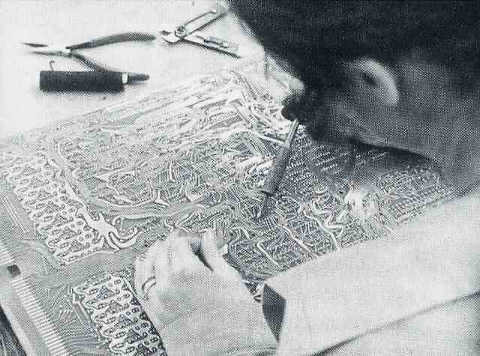 The keyboard of the 100-series machines is of the same design that began with the LOCI, and carried through all but the very last calculators manufactured by Wang. The keycap has a transparent cover under which a paper legend is placed, and the cover snaps onto the keystalk. The keyastalk has a tapered section onto which a round disc is pressed. This disc depresses the plunger of a circuit-board mounted microswitch when the key is pressed. The return spring of the microswitch returns the key when it is released. The design featured a very simple and serviceable design, high reliability, and a unique short key travel, with a positive 'click' both audible and tactile for feedback. The display of the 144 (and other Nixie- display models in the 100-series) is integrated into the upper part of the cabinet of the machine. The display consists of fourteen Nixie tubes soldered to a circuit board that is mounted in a sturdy cylindrical metal housing. A tinted plastic sheet is mounted in front of the cylinder such that the Nixie tubes shine through it. There are large machined aluminum "thumbwheels" at each end of the display cylinder which allow the viewing angle of the display to be adjusted to the user's preference. The Nixie tubes have 1/2-inch tall digits, which are easily read from quite a distance. The display is multiplexed, but at a slightly slower rate than some of the other machines I've come across with Nixie displays, such that a slight "shimmer" is visible. The left-most tube contains only a "+" and "-" to indicate the sign of the number in the display, and the remaining 13 tubes contain the digits zero through nine, and a right-hand decimal point. Numeric entry proceeds left to right, but once a number is "entered", it is positioned in the display such that it is right-justified based on the decimal point selection setting. Leading zeroes are blanked. Decimal points consume an entire digit position. Overflow or error conditions are indicated by the display flashing on and off, at approximately a 5Hz rate. During calculations, the display is blanked, and an indcator on the keyboard panel lights indicating that the machine is busy calculation. When the calculation completes, the display lights up with the answer, and the busy lamp goes out, indicating that the machine is ready for more operations. The fact that the Wang 100-series machines were targeting the mid-range price bracket for an advanced calculator becomes clear when using the machine. The bit-serial architecture, the comparatively slow diode ROM, and advanced math functions coded as ROM-based keycode subroutines all combine to make the machine a bit on the slow side. The Wang 700-Series calculator was likely the fastest desktop calculator ever made, and in contrast, the 100-Series machines are definitely the slowest that Wang built, and among the slower machines of its vintage. Using the "left" and "right" arithmetic units, addition and subtraction complete virtually instantly. However, multiplication and division take an average of 0.7 second to complete. Math operations on memory registers occurs at the same rate as the "left" and "right" arithmetic units. It appears that multiplication and division are implemented using Dr. Wang's logarithmic method, as the amount of time taken for multiplication and division doesn't vary based on the complexity of the calculation. 1 X 1 takes about the same amount of time to generate a result as 999999 X 999999. Calculators using more conventional methods generally take longer based on the number of digits in the calculation, and their magnitude. The built-in functions (functions in the left-most bank of keys on the keyboard) appear to be implemented as microcoded functions, as they generate results ranging from instantaneous (Pi recall, absolute value, integerize) to approx. 150 milliseconds for logarithmic and exponential functions. Where the machine really gets slow is when the option T subroutine trig. functions are used. These functions are coded as keyboard code programs, essentially automatically keying in the operations to carry out the calculation as fast as the machine can operate. This is not nearly as efficient as microcoded routines. Calculation of the Sine of an angle expressed in degrees can take up to five seconds to return a result. The ArcSine operation takes up to eight seconds. Degree/Radian conversions take about 1/2 second. Overall, the machine feels a bit sluggish when performing anything but simple addition and subtraction operations. For the trigonometric functions, the machine is downright slow. The Wang 100-series machines weren't very successful in the marketplace. It appears that not many were sold, as they certainly are among the most difficult to find of all the Wang calculators made. Amidst the competition, these machines simply didn't measure up, utilizing tedious punched card programming, having a slow calculating rate, and a physical design and color scheme that could be considered by some as rather frumpy. These factors combined to limit the machine's success in the marketplace. The Wang 500-Series machines, introduced in early '71, were a scaled-down version of the 700-series, providing a better price/performance ratio than the 100-series machines, essentially ending the viability of the 100-series. The 100-series did contribute some positive value to Wang, as it was the "proof of concept" for memory registers that allowed all four math functions to be performed in them -- a concept that was extremely powerful when implemented in the Wang 600-series calculators. 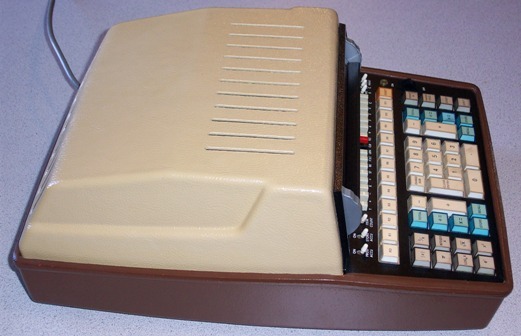 The Wang 600-series calculators were essentially a redesign of the 100-series machines, returning to a digit-parallel architecture, and making use of the higher-levels of electronic integration available by the early 1970's. This exhibit was made possible through the generosity of my parents. My heartfelt thanks for their support of my passion. The Old Calculator Web Museum would like to thank Mr. Andrew Klesh, a Wang employee from 1970-1985, for writing to explain the mystery behind the LRN (Learn Mode) switch on the Wang 100-Series calculators.